When approaching spine surgery, having the means to cure a condition using smaller incisions is valuable. Wisely discerning when to deploy a minimally invasive method is more important still. To access the spine via a traditional open procedure requires a midline cut as long as 6 inches. That incision, coupled with muscle dissection and the retraction required for visualization, causes significant postoperative pain and dramatic risk for blood loss and infection. Recovery requires intensive postoperative rehabilitation and pain management medications. In the 1980s, neurosurgeons first applied minimally invasive approaches to spine surgery. Sumeer Sathi, MD, FACS, FAANS, Chief of Neurosurgery at St. Charles Hospital and Clinical Assistant Professor at Weill Cornell Medical College, explains that these pioneering techniques offered not only new ways to correct spinal conditions but possible approaches for all spine operations. Minimally invasive methods presented new options for treating painful spinal conditions, including chronic back pain, deformity, herniated and degenerating discs, instability, sciatica, spondylolisthesis, stenosis, trauma, and tumors. Dr. Leon and Dr. Sathi use an operating microscope to dissect and expose the spinal nerve. With additional surgical options, physicians face a growing responsibility to match patients with the most effective modalities, says Steven P. Leon, MD, FACS, FAANS, attending neurosurgeon at St. Charles Hospital. When patients present with severe pain, St. Charles Hospital physicians work with them to understand the pain’s intensity and behavior. Through these conversations, neurosurgeons aim to reach a complete understanding of extraneous factors that may influence the course of treatment. An exciting innovation in spine surgery may offer a better way to treat chronic lower back pain. Sumeer Sathi, MD, FACS, FAANS, Chief of Neurosurgery at St. Charles Hospital and Clinical Assistant Professor at Weill Cornell Medical College, explains that research is targeting the spongy part of discs, called the nucleus pulposus, which causes the disc to degenerate when it loses water. Dr. Sathi provides an example of how the St. Charles Hospital neurosurgery team tailors its approach: Performed to diagnose the cause behind a patient history of complaints about pain shooting down one arm, MRI tests sometimes reveal nerve compression at one level of the cervical spine. Typically, the treatment would be microdiscectomy and fusion to relieve the pressure and stabilize the spine. But because fusion procedures — whether performed minimally invasively or not — permanently reduce mobility, neurosurgeons at St. Charles Hospital offer proven alternatives, which are especially important to patients whose careers depend on their ability to move. For the hypothetical firefighter, Dr. Sathi suggests a foraminotomy, which is minimally invasive because the procedure utilizes microscopic visualization instead of muscle and tissue manipulation. Also, it can be performed on an outpatient basis. Neurosurgeons use minimally invasive tube retractors to access the problem area through a small incision in the neck. By removing the tissue encroaching around the nerve through a small opening in the bone, the physician is able to relieve the pressure for the patient. In addition to offering a potentially career-saving alternative for some patients, Dr. Kern notes, this innovative method typically leaves patients pleased with the results. Dr. Sathi and Dr. Leon discuss a potential surgical candidate. For typical fusion surgery, neurosurgeons at St. Charles Hospital can use one of several minimally invasive approaches to access the operative area. Each case presents variables neurosurgeons must evaluate to select an appropriate approach. Traditionally, neurosurgeons approached spinal fusion from the back, making a large, 5-to-6-inch midline incision over the operating site, then spreading the muscles and tissue away from the spine to perform the operation. St. Charles Hospital neurosurgeons commonly perform direct lateral interbody fusion, or eXtreme lateral interbody fusion, on patients with a degenerative disc impinging on a nerve and causing spinal instability. The lateral technique approaches the spine from the side, making two incisions — a 5-centimeter incision and a 2.5-cm incision close behind that in the patient’s side — through which instrumentation passes under intraoperative fluoroscopic guidance. Transforaminal lumbar interbody fusion (TLIF) can be performed on patients with spondylolisthesis — a condition causing radicular pain — degenerative disc disease and recurring disc herniation. Neurosurgeons approach the spine from the back, as in open surgery, using a 2- to 4-cm incision to one side of the midline. Matthew B. Kern, MD, FAANS, attending neurosurgeon, St. Charles Hospital, reviews multiple images, including various angles, of a spine prior to surgery. In a case involving radicular pain shooting down the patient’s left leg, the neurosurgery team performs a TLIF on the side associated with the pain. Using small retractors under a microscope, neurosurgeons make two or three small incisions to the side of the spine, through which they pass a tubular retractor. This acts as a passageway to the disc for instrumentation placement. After removing the degenerating part of the disc on the side compressing the foramen, neurosurgeons replace it with an implant filled with bone graft. Pedicle screws fasten the cage to the disc, realigning the bones and eliminating the pressure on the compressed nerve. In the same way casts on a forearm encourage a broken radius to fuse back together, the cage supports bone graft growth and fusion with adjacent vertebra. Dr. Kern notes that fusions are last-resort treatments, only offered after conservative methods have failed to alleviate chronic pain caused by conditions such as severe spondylolisthesis — in which a vertebra becomes displaced — or single-level degenerative disc compressing the neural foramen on both sides. Although neurosurgeons employ minimally invasive methods, it is still a major operation, and patients typically stay in the hospital for about two days, according to Dr. Sathi. Dr. Kern notes that minimally invasive fusion procedures offer significant benefits. Dr. Kern dissects down through a METRx tube, which is designed to enable visualization of the surgical field during minimally invasive spine surgery. Neurosurgeons may place instrumentation — such as pedicle screws or interspinous devices — at the time of a fusion procedure to strengthen and further stabilize the weakened section of spine. To ensure optimal placement when instrumentation is needed, neurosurgeons have access to several innovative imaging technologies. Dr. Kern explains that, at St. Charles Hospital, the neurosurgery team balances top-notch imaging with patient safety. “Many spine surgeons place pedicle screws in an open fashion, where they utilize fluoroscopy to use navigational systems intraoperatively and limit radiation while still having a precise rendering of the patient’s spine,” he says. A Siemens Arcadis C-arm machine provides multiple views of instrumentation placement during procedures, views Dr. Sathi calls “as close to 3-D as we can get.” Similar to CT scans, the machine takes approximately 100 pictures and reconstructs the imaged area so neurosurgeons can look at it from axial, coronal and sagittal angles. This provides more precise information regarding exact instrumentational placement than normal fluoroscopy images, particularly in patients whose body habitus prevents optimal imaging via standard fluoroscopic imaging. This prevents one of the major complications associated with inserting screws through the pedicle. Because nerves travel just beyond the pedicle, if the screw breaches the bone — which could simply mean one of the screw’s rings went through it — it might touch the nerve and cause severe pain when the patient wakes. Dr. Kern performs minimally invasive spinal surgery utilizing an operating microscope that provides excellent illumination and magnification. Some spine procedures have been minimally invasive since their inception. Dr. Leon says neurosurgeons becoming facile with operating microscopes pioneered microdiscectomy — a procedure to remove herniated discs. As the procedure evolved, some surgeons introduced minimally invasive tube retractors into the process, but the incisions required for those were nearly identical to those made in traditional procedures. The St. Charles Hospital team, preferring evidence-based models to minimally invasive approaches for their own sake, has been able to use the standard retractors in a minimally invasive manner. Patients require microdiscectomy when the herniated disc pinches the nerve, causing leg pain, numbness or weakness. During an outpatient procedure, St. Charles Hospital’s neurosurgeons remove the herniated disc and relieve the patient’s symptoms. Dr. Kern performs minimally invasive spine surgery through a METRx tube. The most common procedure neurosurgeons perform at St. Charles Hospital eschews metal screws or plates. Dr. Leon frequently performs kyphoplasty, a pain-relieving procedure designed to stabilize and strengthen vertebrae damaged by compression fractures. Cancer — including multiple myeloma and various metastases — and osteoporosis are the most common causes of compression fractures, which result from the bones weakening or thinning until they collapse. When caring for patients with severe pain that doesn’t improve following conservative therapies including bed rest, medication and physical therapy, neurosurgeons often find kyphoplasty to be the best option to reduce pain and improve quality of life. Kyphoplasty is an outpatient procedure that St. Charles Hospital neurosurgeons perform while patients are under general or local anesthesia. In a process similar to angioplasty, surgeons use real-time X-ray imaging to guide a large needle through small incisions on one or both sides of the spine to the collapsed vertebra, Dr. Leon explains. When the needle reaches the targeted bone, Dr. Leon introduces a balloon through the needle and into the bone; he then inflates it. 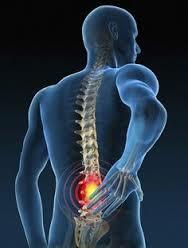 The balloon restores the vertebra to its normal height, relieving the painful pressure. To keep the vertebra from collapsing again, Dr. Leon fills the space by injecting bone cement called methylmethacrylate. Spine surgery is no minor matter, even when performed through minimally invasive methods. One of the benefits patients glean from undergoing minimally invasive surgery is the ability to more quickly begin rehabilitation programs afterwards. Patients should go to a facility dedicated to offering the highest levels of rehabilitation and therapeutic treatment, in addition to leading-edge surgical techniques. Dr. Sathi notes that, from a surgeon’s perspective, St. Charles Hospital is ideal because it provides its surgeons the most technologically advanced surgical techniques and offers patients excellent postoperative care. Psychologist Abraham Maslow once observed that to one who only has a hammer, everything begins to look like a nail. Exciting new technologies and techniques are well and good, but along with innovation comes the ultimate responsibility of applying it in the best way possible. At St. Charles Hospital, neurosurgeons demonstrate their commitment to the well-being of their patients not by providing the latest bells and whistles, but by offering the best treatment available to each individual condition.